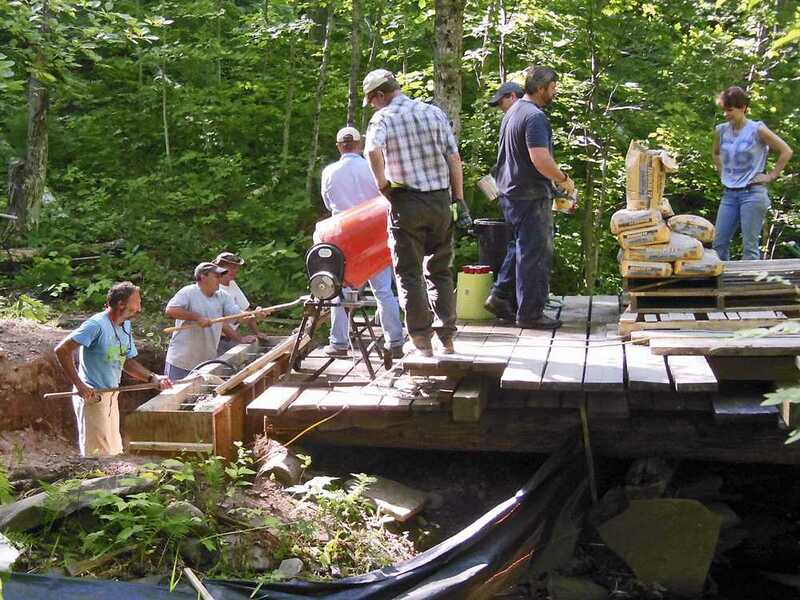 Work this summer continues on replacing the old wooden Middle Bridge, in the Swedetown Gorge Nordic Ski Trail. 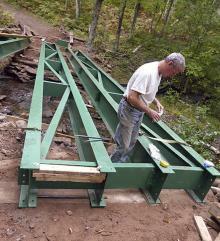 On Saturday, October 3rd, final work began on the new Swedetown Gorge Middle Bridge. The order of the day was to install the wooden planking, atop the steel girders. 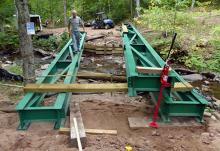 The longitudinal stringers had already been installed previously, so the work to attach the cross planking began. 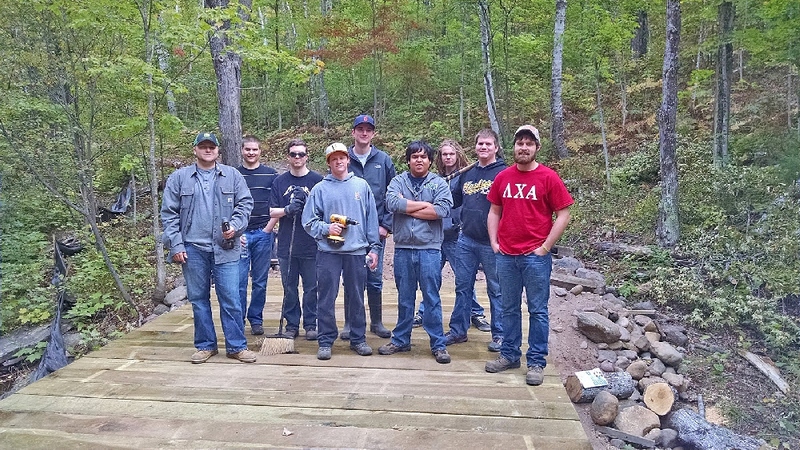 Helping were members of MTU Lambda Chi Allpha Fraternity. (KNSC photo). Another look as planking was begun. End planking was also done to allow landscaping the back fill into place. (KNSC photo). Plank by plank, the decking begins to take shape. These are 4" thick planks. (KNSC photo). Sometimes you have to get your feet wet, to get perspective. (KNSC photo). 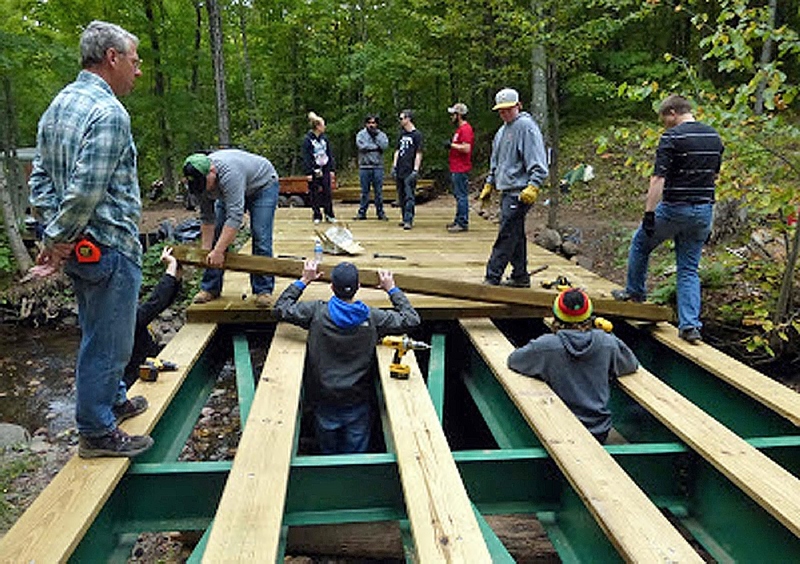 With all the planks finally in place and secured, the Frat crew gather for a photo. Well done guys, many thanks. (KNSC photo). 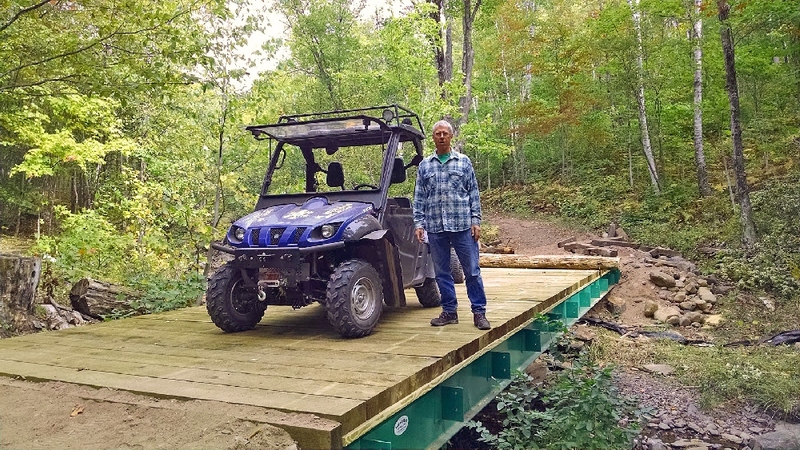 KNSC’s Mark Roberts, has the pleasure of putting the first vehicle across the new Swedetown Middle Bridge. 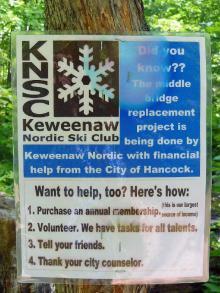 Great job, Mark, and all the volunteers from the KNSC. 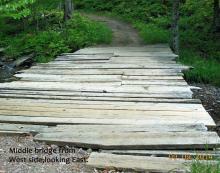 (KNSC photo).PREVIOUSLY .. ..... 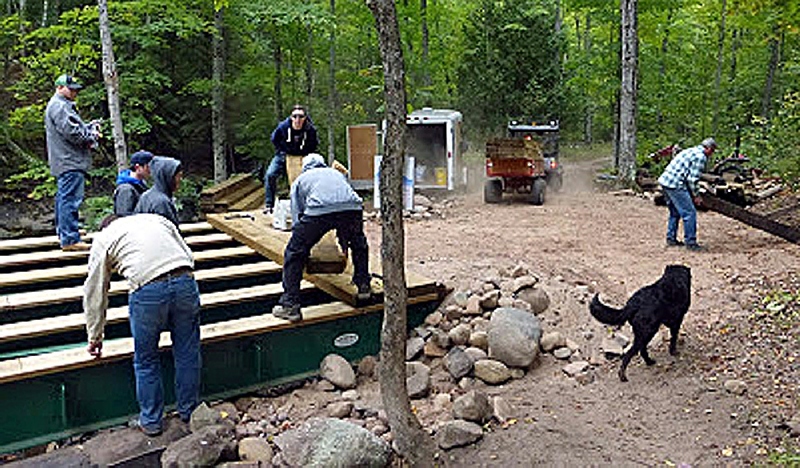 Early September brought the transporting of the three large steel beams from the Fairgrounds, down Sisu Hill, and up the Gorge to the Middle Bridge. Due to the 40' length, there were some tight corners. [KNSC photo]. 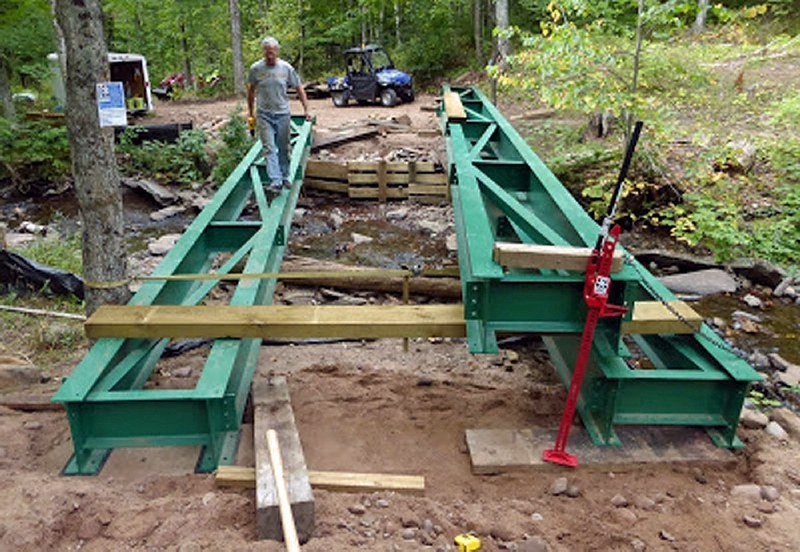 Finally, all three beams are on site, and placed on temporary supports that rest not on the current span, but on the new concrete abutments beyond the current end supports, two stacked on one side, one on the other. 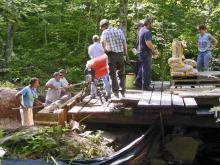 All were moved and lifted with essentially auto jacks. 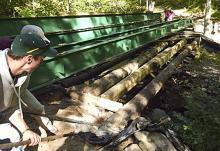 City Photog Roland Burgan walks the old bridge for the last time, while inspecting the new support beams, in the middle of September. 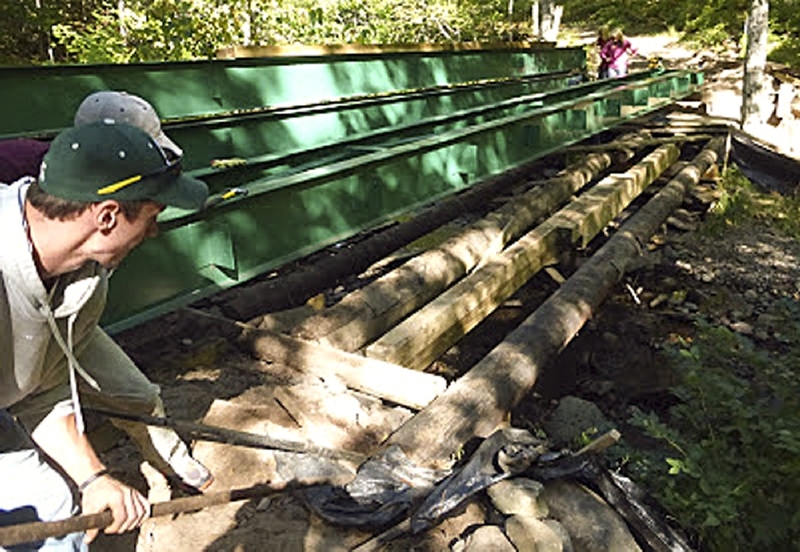 With the beams now on site and in position, KNSC workers with some outside help, begin to remove the old bridge, first the planking, already gone here, and now the wooden poles and beams underneath. [KNSC]. 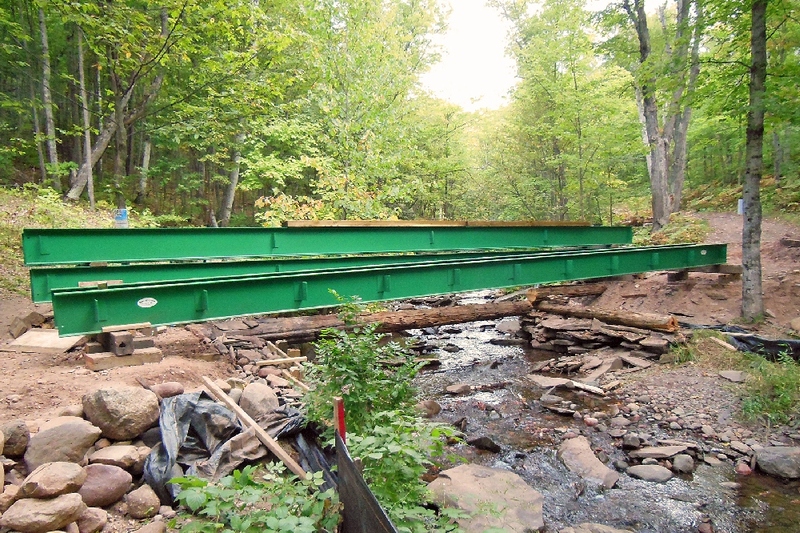 And with one exception, the old bridge is no more, with the new beams resting on the new abutments, the third week in September. 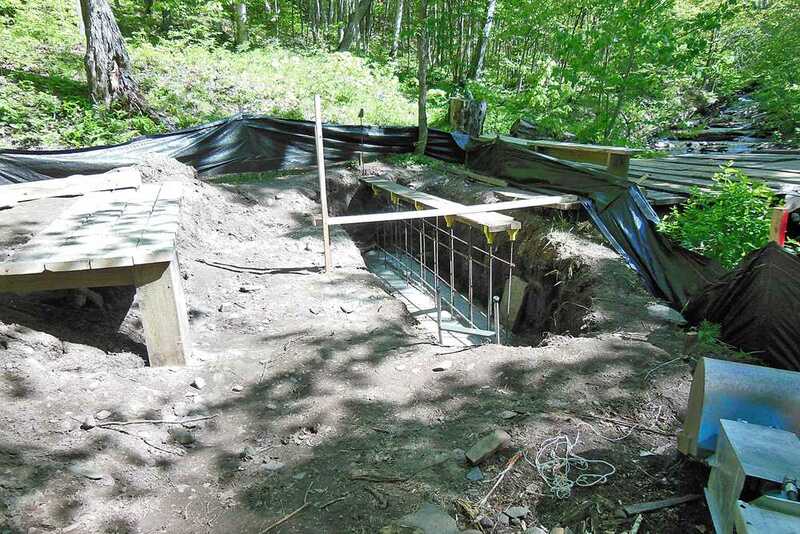 The first order of business is to uncover the previously poured concrete supports, and clean off the tops, which had been backfilled to complete the strength. 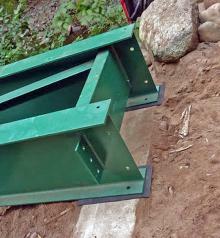 The single beam will be tackled first. [Next 5 photos -KNSC]. 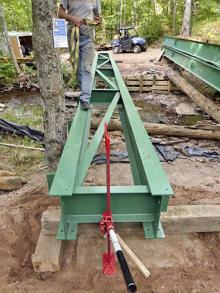 Using jacks, the beam is slipped into the proper position on top of a temporary support board, as final placing is undertaken. Placing rubber pads in place underneath, the beam is then lowered into final position on the concrete abutment, then repeated on the other end. One done. 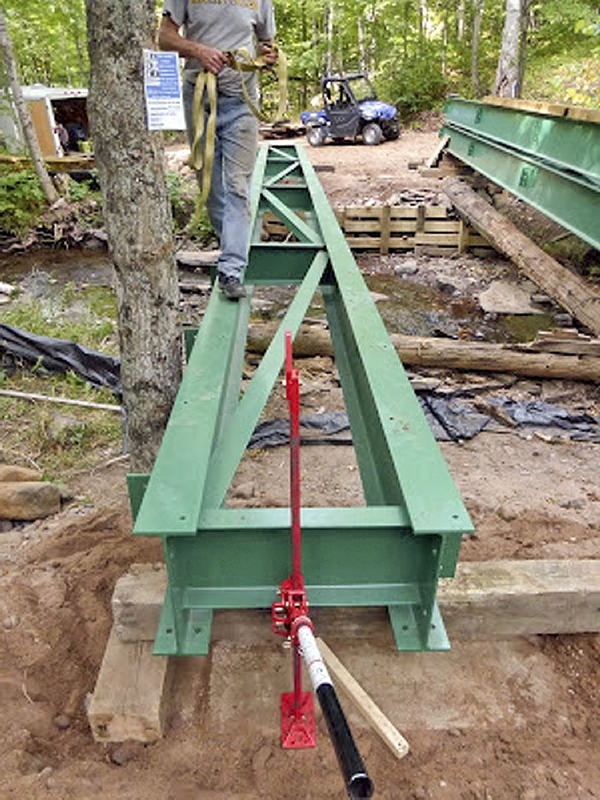 The stacked beam, which will be the center beam, is carefully placed upon a heavy plank, then slid over to its center final position, then lowered as per the first beam into its final resting place, both ends. 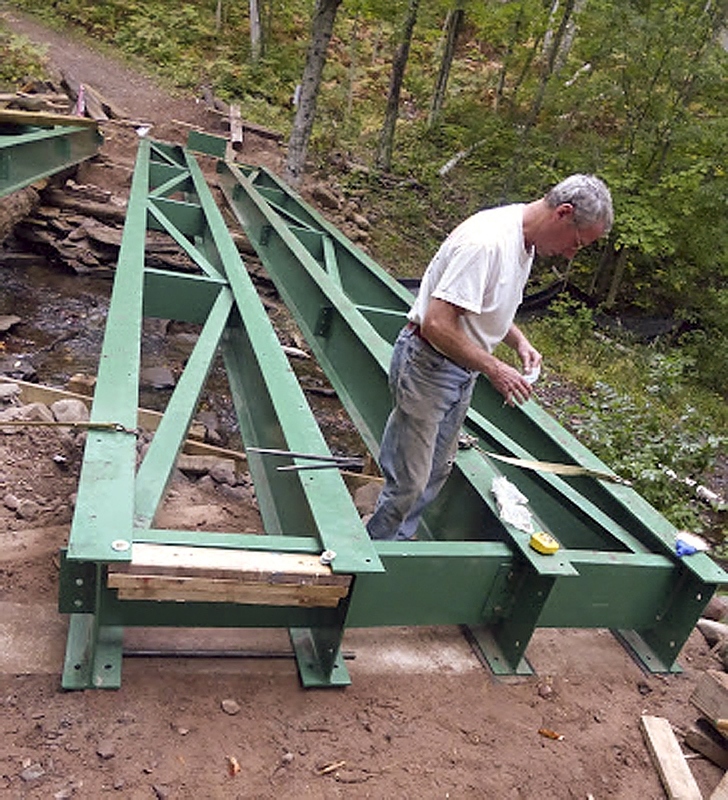 The final beam will be almost in place where it was put earlier, as per the plan, and is itself finally put into place. 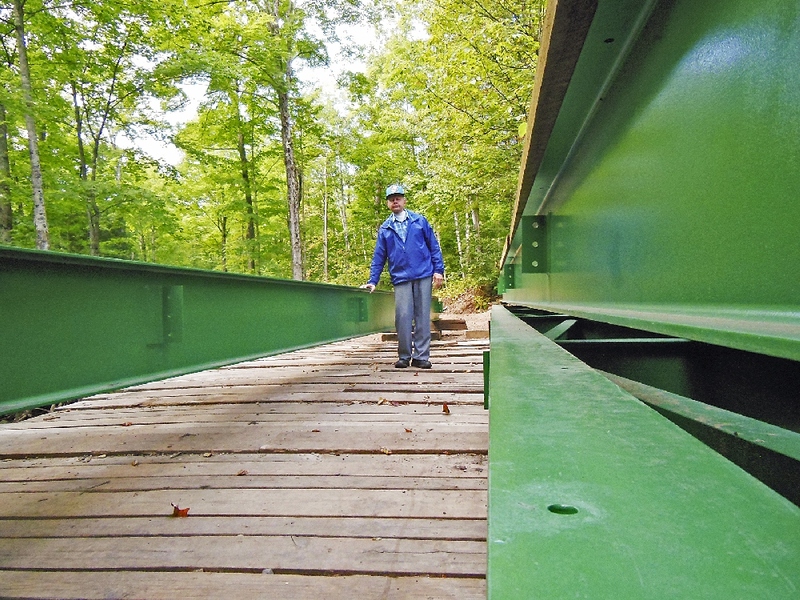 Bridge designer Mark Roberts, walks the beam. 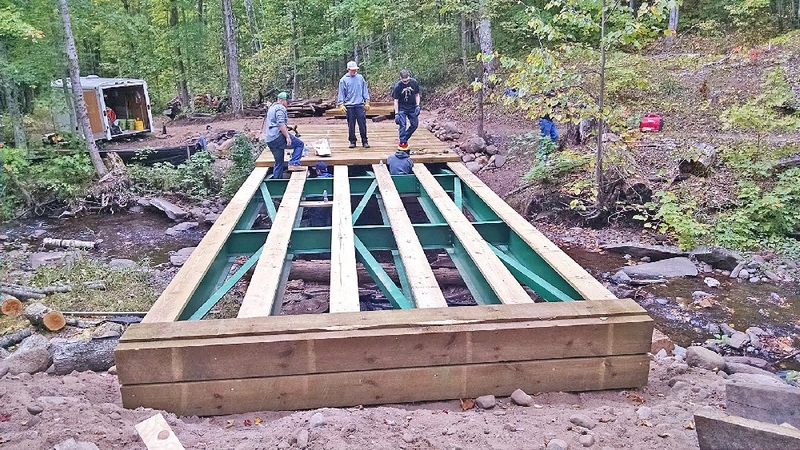 With all three beams in place, it is now time to install the cross plates that will complete the steel structure strength. 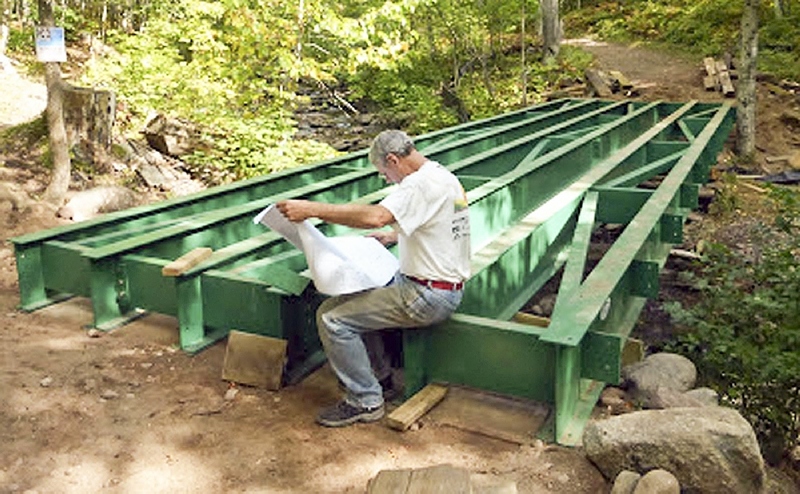 Mark checks the plans, before completing the interlocking panels, but the steel portion is completed by the end of September. 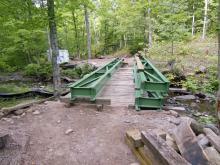 Next will come the wooden planking installation, but this bridge will be ready for use this winter. Also still needed will be some earthen back fills on both ends of the bridge to raise the level of the road to meet the level of the new bridge. PREVIOUSLY... This is the original Middle Gorge Bridge, which will be replaced with a steel bridge. 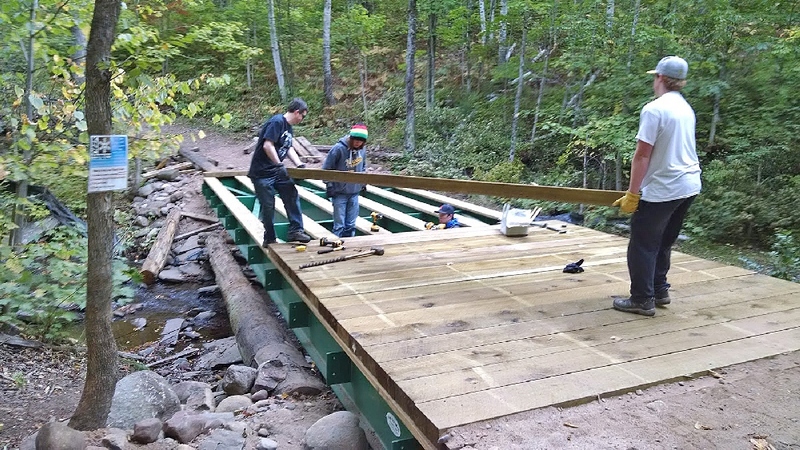 Starting in early June of this summer, work by the Keweenaw Nordic Ski Club began on the replacement of the bridge, with a steel girder one. Concrete supports would be required on each end, to fully support the new span. Here, the first pour for the west end support. On July 4th, the final pour on top of the header is done, completing the new west end bridge support. Our thanks to the KNSC for this photo. 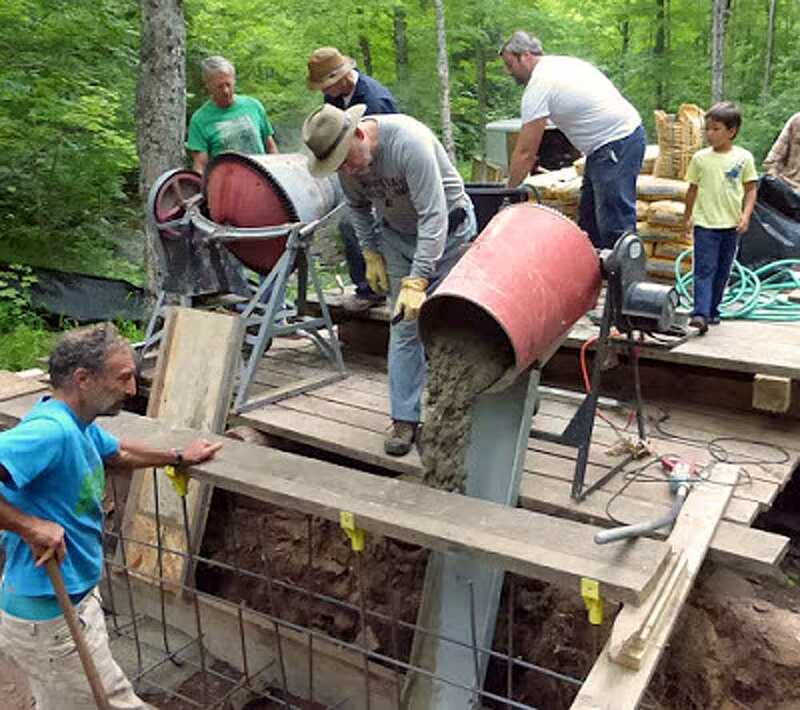 Later in July, the footer is poured for the east end support, and on Aug. 1st, work starts on the big pour (35 bags of premix) to complete this support. 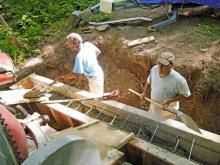 Again, all work is being done by the KNSC. 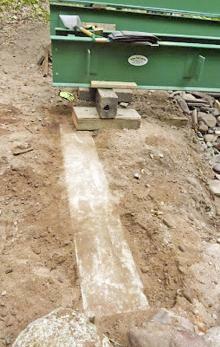 Two small generator powered mixers keep the concrete coming for the fellows to agitate and level out in the form. In a job well done by all, the form is filled. 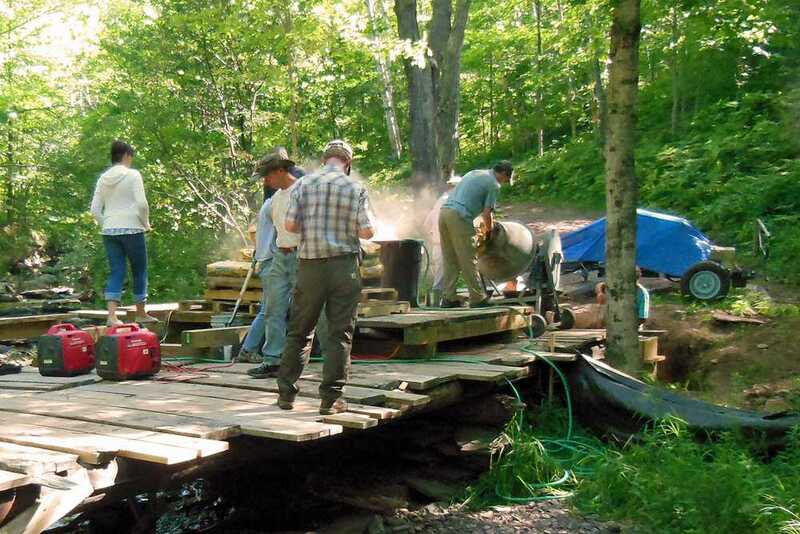 When set, this will be the needed second support for the steel beams, which now becomes the next major hurdle ... how to transport and set the large steel girders onto the now completed support ends, in the middle of a gorge. 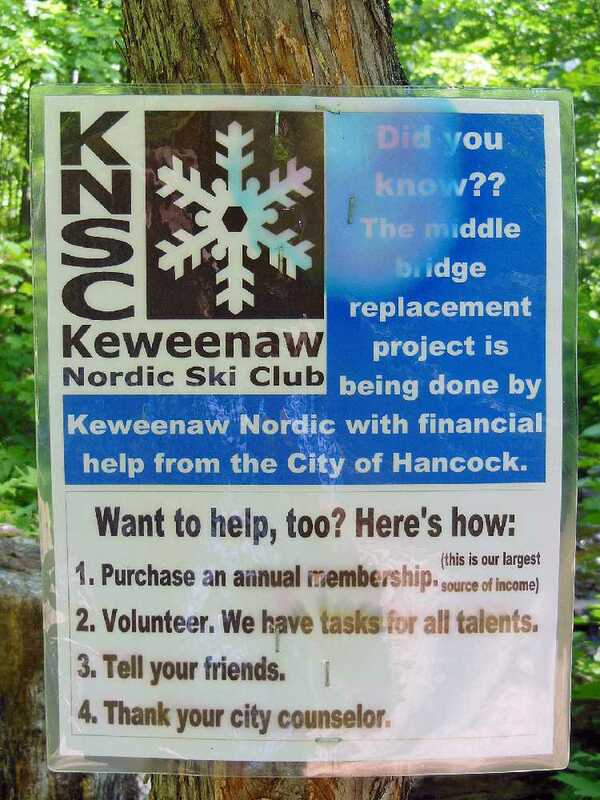 The sign on a nearby tree gives info for anyone wishing to help in any way in this ambitious project.